Jim is a member of the Roots Oversight Team. He loves to teach and especially loves to teach the Bible. He became a believer as a teenager, but recommitted his life to Jesus in 1986. Jim is married to Nora and they have been a team since 13 February 1982. They have 2 daughters - Melissa Flores, married to Richard, and Emily who will be a Freshman at Western Washington University this fall. Jim likes to be outdoors. He likes to hike and fish. Occasionally he hunts when he remembers to buy a license. Jim is an avid gardener, primarily of things you can eat. He likes to do woodwork and is a pretty good handyman. Jim was born and raised in South Carolina, which explains the wonderful accent he has. He always looks forward to college football and always pulls for his alma mater, the Clemson Tigers. Jim is a retired US Army Officer and has been blessed to have seen much of the world. He has also been a logger, a business trainer, and a Real Estate Broker. 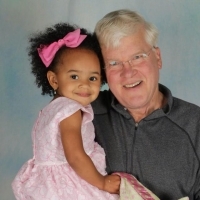 He is now a full-time grandpa for his amazing grand-kids, Raziah and Melle-Rozeigh.